Welcome to the new online home of the Gilroy Beekeepers Association. We are a 501c3 charitable organization whose mission it is to share our knowledge of honey bees and beekeeping and provide help with swarm removal in southern Santa Clara and northern San Benito counties. 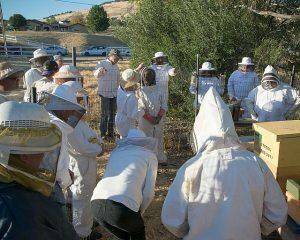 Since 1997, Gilroy Beekeepers Association has been dedicated to furthering an interest in bees. We love bees and share what we know about beekeeping with each other and with our communities. So whether you are an experienced apiarist, a novice beekeeper or venturing into honey farming for the first time, we look forward to meeting you. Become a member now or drop by one of our meetings to hear how local beekeepers manage their hives through the seasons, exchange ideas or techniques for creating the optimum pollinator environment for your bees, or ask questions about getting started - and consider joining us for more! We regularly invite speakers to share their expertise about anything 'bee', from landscaping designs to encourage bees to feel at home in our yards, to innovative uses for honey, to everything you wanted to know about top-bar hives but were afraid to ask. Check for upcoming events here. In the community our Association is an educational resource on bees and how to handle swarms safely. We offer classes, field trips and a chance to hang out with us at a county fair. If you are not sure about beekeeping and want to start by reading up on how the honey bee came to be kept in North America, feel free to explore our resources and blog posts where you can also download some free oldies but goodies. These books, although dated in some areas, provide lots of basic information on beekeeping in California before you pay for your first 'how to' book!